Man believed to head Castañas gang involved in alleged Moroccan hashish operation. Spanish police have arrested a man alleged to be one of the biggest drug-smugglers operating on the violence-ridden stretch of southern coast close to Gibraltar. The man, named in media reports as Antonio Tejón, is one of the two brothers who head the Castañas gang, which allegedly brings huge quantities of hashish over from Morocco on powerful speedboats. He was detained in the early hours of Thursday after a 19-month search. More than 100 police officers and customs agents were involved in the operation, which took place in La Línea de la Concepción, a town close to the Gibraltar border. “After numerous investigations, officers learned that the suspect often visited a house in the town and [they] set up a surveillance team to gather information,” the national police force said. According to the statement, officers had to move quickly because of the limited time the man spent at the house, the security measures he had put in place, and the presence of “third parties”. The police said the man had been on the run since the end of 2016, when a major investigation resulted in 30 arrests and the seizure of one tonne of hashish, €350,000 (£310,000) in cash, 16 vehicles, three semi-rigid boats and a number of guns. The area around the town known as the Campo de Gibraltar has been a smuggling hub for centuries. Recent years have seen a surge in trafficking – and in clashes with police officers. In April last year, 100 people threw stones at police officers as they tried to seize a consignment of hashish on a beach. 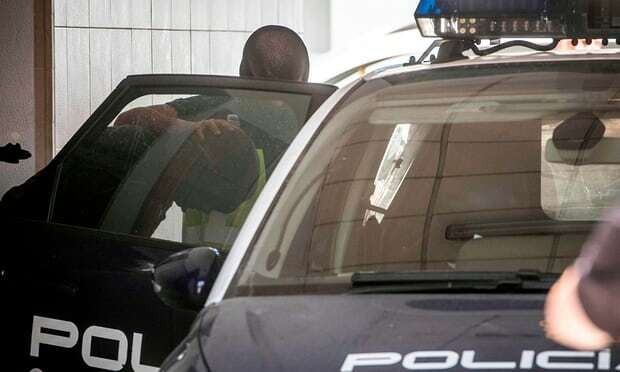 Four months ago, 20 masked men stormed the hospital in La Línea to free a suspected drug trafficker, while a group of off-duty Guardia Civil officers was attacked by a crowd armed with baseballs bats and broken bottles in nearby Algeciras in mid-May. Unions representing local Guardia Civil and national police officers have called for urgent reinforcements to address the security situation amid fears it could escalate further. Community leaders, meanwhile, say the Campo de Gibraltar, which has one of the highest unemployment rates in Spain, needs investment in both jobs and education. Juan Ignacio Zoido, who was interior minister until last week’s change of government, had insisted the authorities were making progress. Last year, police seized 145,372kg (320,490lb) of hashish in the region and 11,785kg of cocaine, while an elite Guardia Civil unit has been redeployed to the area.